Previously, we’ve reviewed Strong Tonic’s Extraordinary Tonic Syrup ([icon name=”star” class=””][icon name=”star” class=””][icon name=”star” class=””][icon name=”star-half” class=””]). From Oklahoma City, they’ve done quite well since their launch and their newest product is a floral spin on their initial offering. Hibiscus has begun appearing in a few contemporary style gins, but has nowhere reached the popularity of Elderflower. So you’re not going to have the same frequency of flavor convergence when mixing with this syrup. But you are going to add a floral touch to your drink. So if that’s not your style of G&T there’s probably not much that will convince you. But if you are, well then you’re in for a treat. The syrup is thick and viscous, but still flowing. It’s a lovely oxblood in hue, which lightens dramatically when mixed in a cocktail. The nose is bright and sweet, with molasses, fruit cake, cinnamon sugar, and hibiscus tea notes. Sipping on its own, you can really appreciate how bold an assertive the quinine component is in here. It’s not a floral mixer, it is clearly a tonic. Sweet, with cinnamon, nutmeg, raisins, and the finish is bright and slightly spice with a refreshing hibiscus after taste. When mixing, it’s lovely how it adds some spice up front, bitterness where you expect it, and a floral note at the end that doesn’t hit you in the face. It’s subtle, present, and refreshing. It adds complexity to simpler gins, and although it’s strong perspective can [and does] overpower more subtle gins, I think I slightly prefer the hibiscus variation. 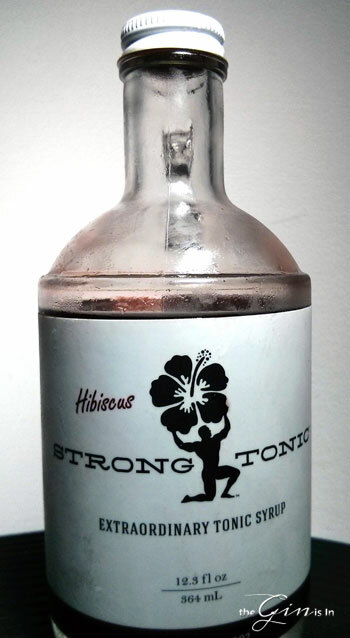 I recommend Hibiscus Strong Tonic with spice forward contemporary gins or assertive juniper forward classic style gins. Rating: It adds a contemporary floral lift to any gin you might mix it with. Though it’s assertive and can overpower mild gins, the same is true for most tonic syrups. I’d say that two of my favorite combinations were paired with Darjeeling Gin ([icon name=”star” class=””][icon name=”star” class=””][icon name=”star” class=””][icon name=”star” class=””]) and Gordon’s Gin ([icon name=”star” class=””][icon name=”star” class=””]).